Please note this is a two day course: Monday 13th and Wednesday 15th June. This course provides you with the skills to offer a marketable treatment to your clients. Facials are no longer considered a luxury treatment and care of the skin has become more important over the last few years. 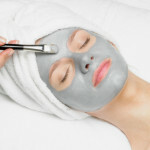 You will also learn how to apply two different masks, Faith lift mask which is a non-surgical facelift system that gives dramatic results your clients will love even after just one treatment & the Maskerade mask which is a mineral rich mask which will gently cleanse, detoxify and exfoliate in just one 5-10 minute treatment.